My name is Sthavi Asthana and I am a 19-year-old girl with a passion for horses and horse riding. I have been competing in equestrian sports since 2009 ( with a break in 2012- 13 due to studies). The events in which I compete are Dressage and Show Jumping, both of which are events in the Asian games and Olympics. My dream is to represent my country in these or in eventing (which is a combination of 3 events viz, dressage, show jumping and cross country jumping). Equestrian sports are the only sports in the world where women can compete on equal terms against men as there are no separate events for girls / women. There are very few girl competitors in equestrian events today and most of them concentrate on dressage, whereas I compete in show jumping also. I have so far won a total of 72 Medals and 5 Trophies (27 Gold, 17 Silver, 28 Bronze) in 4 years of competing. FEI World Challenge Dressage Nov 2011: International Rank 7 (National 1) in Preliminary Jr. Class. 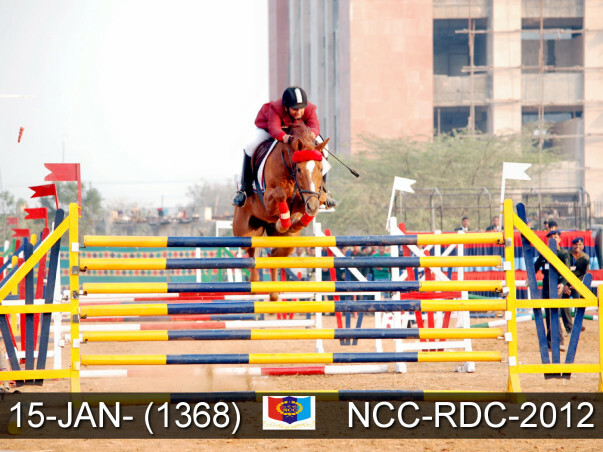 NCC RDC Jan 2012: Cleared 6 Bar jumps at 1.75m – noncompetitive event at 16 yrs age (National Open record Seniors is 1.80m since 2003). DHS 2012: 2 Gold, 3 Silver, 6 Bronze medals (Total 11 medals). Out of these at 16 yrs age: 1 Gold, 1 Silver and 1 Bronze are in (open) Preliminary Jumping (Top score and Normal). This category is open to all ages Top riders of Military, Paramilitary, Police, President’s Bodyguard and civilians participated. 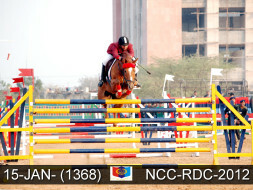 National Equestrian Championships 2011-12 (Delhi): Novice Jumping – Team Silver (at 16 yrs age). (National Equestrian Championships are open to all ages. Top riders of Military, Paramilitary, Police and President’s Bodyguard and civilians participated). Also awarded the Rani Laxmibai Sports Award for 2012-13 by Govt. of Uttar Pradesh. While I have learnt the basics of riding on police horses I lack proper, formal coaching. I had to learn the fundamentals of maintaining a good position or the subtle aids (signals from rider to horse) which are necessary for competitive riding through the internet and books, which are no substitute for a coach who could point out my mistakes, correct them, and also help further advance and improve my technique. I compete against riders who ride horses trained for show jumping and dressage. They are coached on trained horses and have been practicing on them for years, developing a bond and building a measure of confidence with the horse. Riders who compete in these regional / national and International competitions have specialized and dedicated horses and take regular coaching from expert instructors. Majority of my competing riders also have their own well bred, imported, trained horses with whom they share a strong bond, which is a great help, as riding is a partnership of horse and rider. They practice for hours every day, months before each competition, while I compete on borrowed horses on which I get at most half an hour / an hour’s practice before the actual competition. I have reached this far and am counted among the best in the country on basis of my natural talent and hard work alone. However to progress further and be world class, I need proper coaching and well bred, trained horses on which I can practice regularly. The expenses involved are unaffordable for my parents, hence I request you to consider sponsoring me, in full, or in part. This would include horses (buying/leasing and maintenance) and training expenses (India and abroad). The indicative costs of sponsorship are Rs. One Crore. I am looking at a five year time horizon and a try for the 2018 Asian Games. Your will be promoting a girl in an event where boys and girls compete equally, and offering me the opportunity to bring glory to our Nation at the International level. As per the opinion of some of the top instructors and judges of equestrian sports, I have the potential to do so – with a Sponsor’s support. 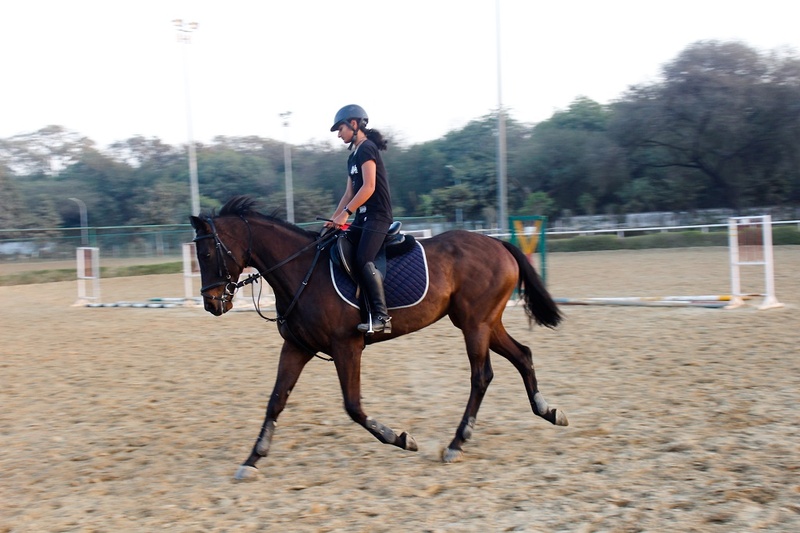 I am Boaz and I met Sthavi Asthana during her equestrian practice hours in Delhi. She likes to read sports magazines and play other sports when she has time. She is currently pursuing her law from the National Law University in Delhi. Although it is hard for her, Sthavi is trying her best to maintain a balance between studies and sports. She is fundraising to get the needed support for her training at the Army Equestrian Centre. In order to get the required coaching, she needs to pay the club fees and buy trained horses, amongst the other requirements. She desires to compete in the 2018 Asian Games. Although I had to wait for her practice to get over in order to talk to her, it was exciting to see the way Sthavi was riding the horse and performing the stunts. I was spending my time experimenting with photography by taking multiple moving shots of the horse. “I keep hearing about Milaap. It’s a pretty famous site now a days,” replied Sthavi on asking how she came to know about Milaap. In order to compete at international level, she would require quality horses and specialized training,which would cost a lot more relatively. 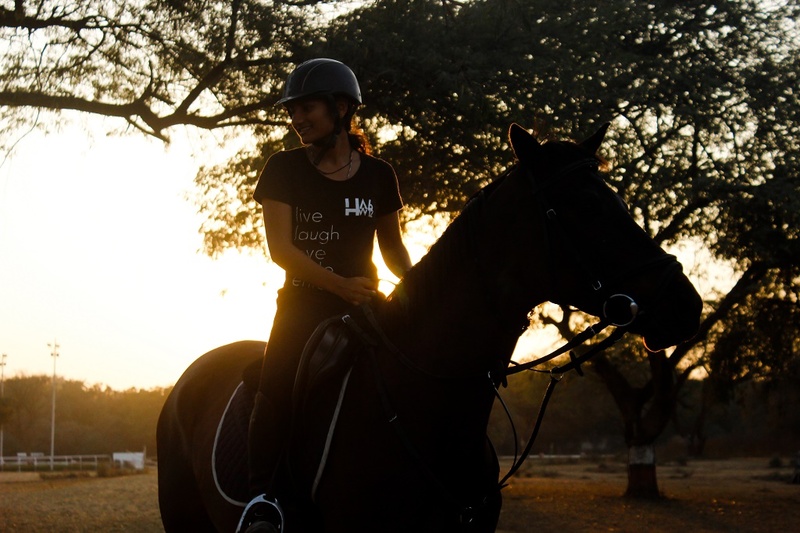 One day when Sthavi was nine years old she went for a joy ride on a horse with her parents and ended up liking it so much that she decided to pursue it seriously. Sthavi became a permanent member of the Army Equestrian Centre club last year itself, she kept her horse there temporarily earlier. The competitions in India happen mostly during the winter season. There are three types of events in the equestrian sports in the Olympics - dressage, show jumping, and cross country. In dressage competitions, one has to perform a prescribed set of movements and the points are subjective. In show jumping, one has to jump over poles, failing which costs 4 points. Lastly, in cross country one needs to overcome various obstacles set along the way covering a long distance. Eventing is a competition combining all these three events. Sthavi desires to specialize in eventing to compete at the highest level. This particular sport tests the bravery of the rider, control over the horse, and precision over the jumps, amongst other skills. Sthavi is currently undergoing extensive training with someone, who served as a coach at the Asian Games 2014. Sthavi desires to get the necessary coaching abroad in order to reach the next level. Her favourite sportsperson is Michael Jung as he has made eventing history by becoming the first rider to ever hold the Olympic, World and European championship titles at the same time. I tried to learn a few technical terms used in sports like trotting,canter, gallop etc. The pace after a walk is called trot, the slow paced jumps while trotting are known as canters, and the fast-paced canters are known as gallops. 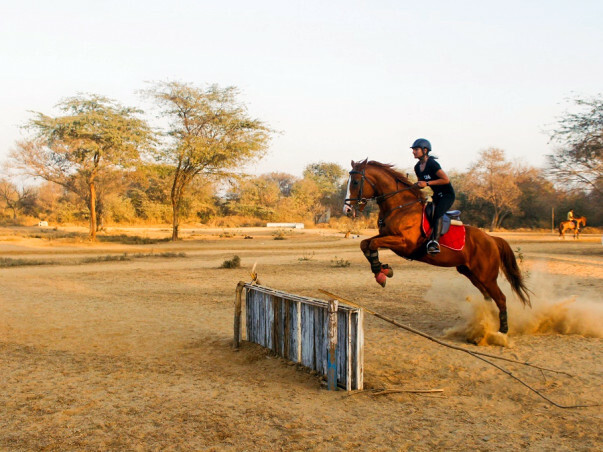 Like most of the sports, Equestrian sport is also not well developed in India. Apart from a lack of infrastructure, proper coaching, and availability of equipment,there is a dearth of opportunities in this particular athletic activity. It is difficult for one to get into due to the expenses and training facilities in this sport, said Sthavi. 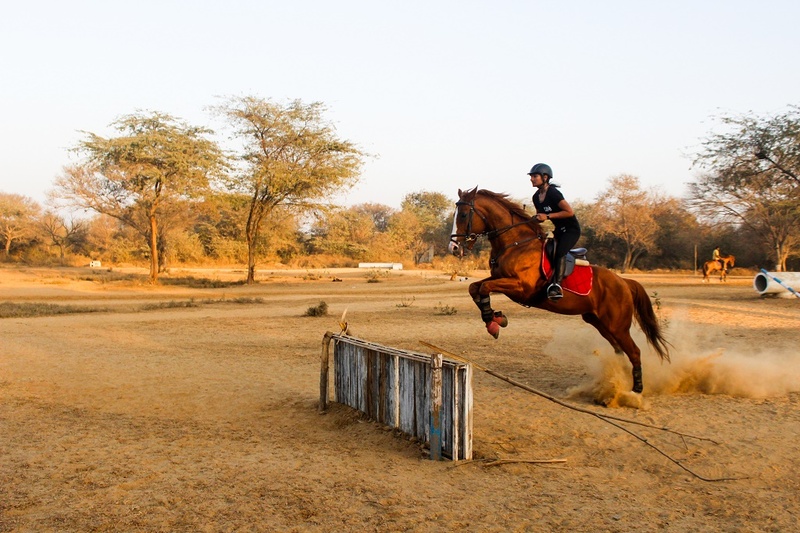 The Indian Army has the majority of competitors as they have access to horses, grounds and training. She has two horses namely ‘Red Cat’ and ‘Blue Steel’ on which she used to take part in races. However, in order to compete in international competitions, one needs horses which are well bred and trained for sports. But those horses are very costly and could cost around Rs 30-40 lakhs. She chose to keep her horses in one of the best place in Delhi i.e the Army Equestrian Centre as the other options are not good due to lack of space and facilities. There are no well-known Equestrian sportsmen in India. Moreover, one needs to find sponsorships by themselves as a majority of people are not even aware about the existence of such a sport. Unfortunately, the sports federation in India doesn’t get proper funds from the government to train its team. Sthavi shared an incident with me, wherein she was selected for a training session in Germany. However, owing to lack of funds by the federation, she couldn’t go for it. If her campaign’s a success, she plans to import a horse in the coming months.